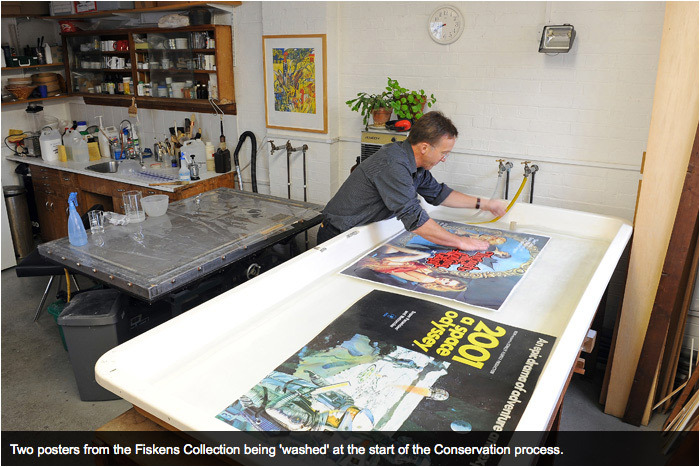 Restoration not only acts to de-acidify poster paper but at the same time, posters can be "washed" & cleaned, removing surface detritus & enhancing underlying colours. Usually, a poster will then be laid onto a PH neutral backing (usually unbleached linen though conservation paper backing is also available). The benefit of backing is several fold. Once backed, a poster can be framed without the use of a window mount provided the poster is framed with fillets to separate the poster from the glass. Most damage to posters or prints is caused by bad framing & it is important to use museum or conservation grade matt board & most importantly to put a barrier inside the frame to protect the poster from acid migration from the back board. Ultra violet conservation glass or perspex should also be considered as a worthwhile investment to protect the poster from daylight. Backing of course, also acts to "flatten" posters. Since the majority of vintage cinema posters come folded (most were machine-folded just after printing as this made it easier for them to be posted out to cinema managers around the country), linen-backing minimises foldline discrepancies. In many cases, the original foldlines on a vintage poster become almost invisible after linen-backing (it depends on the poster design & extent of original wear on the foldlines). Obviously, from the perspective of display potential, linen-backing greatly enhances a poster's appearance. The dealer community also tend to favour linen-backed posters as it provides extra protection & makes items easier to transport to shows/exhibitions/client presentations etc. 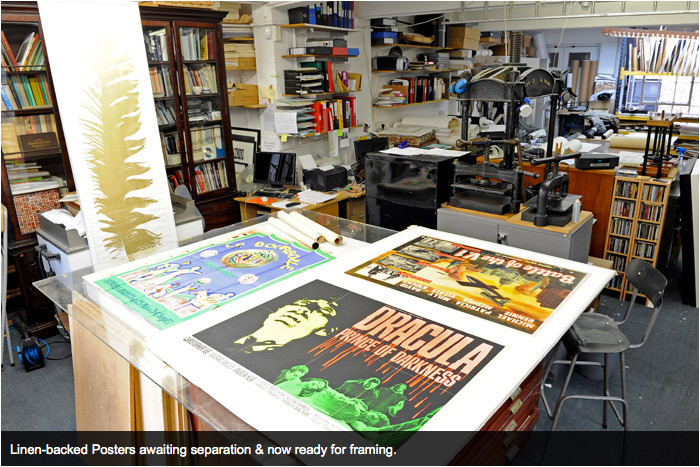 Though there are a few collectors who will only buy un-restored posters, the vast majority of the market accept the process as long as it is done properly. The key to any Restoration is that it is carried out in accordance with recognised Conservation techniques, specifically that it is reversible. 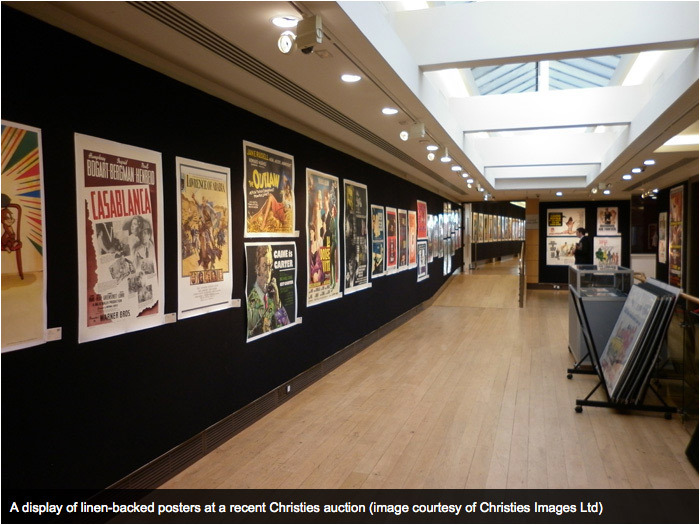 It is a sign of accepted "best practice" that the majority of posters offered via Christie's auctions (both Travel & Cinema Posters) are linen-backed these days. 10. Re-touching & filling-in any paper loss. It is not recommended that home-made Restoration is considered as each of these steps may involve particular additional procedures, depending on the poster in question. 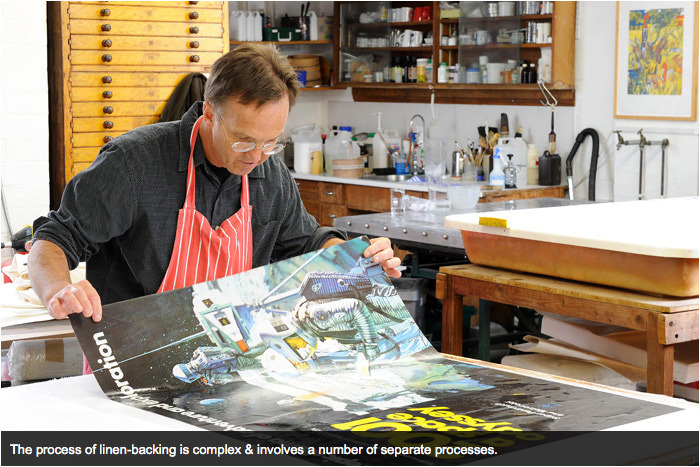 Where posters have become damaged or defaced, a certain amount of remedial Restoration work can be carried out during the process of linen-backing. Incidences of paper-loss can be resolved with in-filling & colour loss to foldlines etc can be rectified with touching-in. The philosophical approach behind the Gregor Fisken Collection, however, is for any such Restoration to be kept to a minimum & to be done in such a manner as not to undermine the integrity of the poster itself. There is some debate in the market about the extent of Restoration that is acceptable. 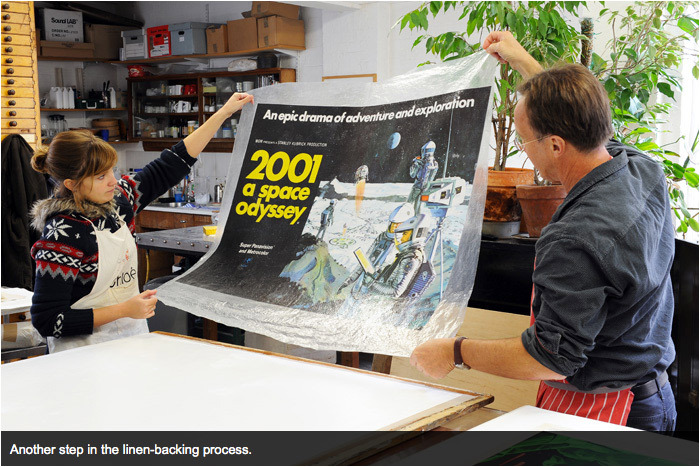 Back in the 1970's, valuable posters were frequently, dry-mounted (heat sealed onto board). Whilst this was acceptable practice then, it is wholly unacceptable now. As this process is irreversible, such posters are now virtually worthless. Similarly, posters in the 1970's-80's, were sometimes laminated. These posters can be released by a skilful Restorer but the process can be extremely time consuming & as a consequence, unless a poster is worth £1,000+, the task is hardly economic ie, again such posters are rendered virtually worthless. In recent decades, the practice of over-spraying faults has been adopted by some in the market. This is a technique which is not accepted within the Gregor Fisken Collection. The problem with over-spraying is that it becomes a point of contention as to whether a poster remains a poster or is reduced to some quasi-painted status. To discern whether a poster has been so treated, hold a poster up at an angle & normally the over-painted area can be seen. Currently the market is not discriminating particularly against over-sprayed posters but it is our contention that as the market becomes more sophisticated so posters which have been re-sprayed will become less popular. We believe that the major auction houses will soon have to provide more extensive condition reports & declarations as to the extent of Restoration. It is likely therefore that posters which have been properly Conserved & Restored but where Restoration has been kept to a minimum, will be more highly prized.